Red Bull's Sebastian Vettel said he was "not that bothered" about slicing 18 points off Fernando Alonso's lead in the world championship standings. Vettel is 24 points behind the Spaniard after finishing second in the Belgian GP. Alonso crashed out at the start. "Right now, I don't care in terms of scoring and points. Of course I care for the championship," Vettel said. Fernando Alonso failed to match Michael Schumacher's record of 24 consecutive points-scoring finishes as a result of his crash. "Fernando didn't finish, these things happen. There are a lot of races [left] and you saw how quickly things change." He added: "I'm not that bothered about points and gaps." 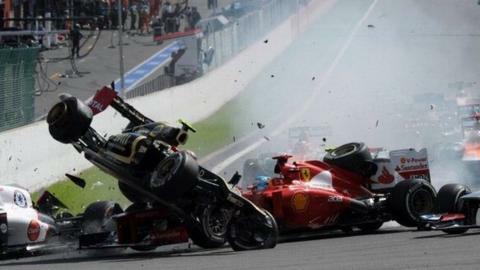 Alonso was blameless in the first-corner shunt, in which Lotus's Romain Grosjean flew over his car after colliding with McLaren's Lewis Hamilton. The Spaniard said: "It was a disappointment because of the race points lost but also lucky because in five days' [time] I can be in the car in Monza." The race was won by McLaren's Jenson Button, who had insisted beforehand that he still had an outside chance of the championship despite being 88 points behind Alonso. Button reiterated that view after closing the gap to 63 points with 200 still available in the remaining eight races. "It's a massive long shot to win the title but today proves you can claw back 25 points very quickly," Button said. "A great day for me. It proves anything is possible. "There are so many people who have a chance to win. There is a small chance I can fight for the championship. But going to Monza I don't think about the championship, I go to do the best job I can and get the most points I can." Kimi Raikkonen finished third and moved ahead of Hamilton into fourth place in the championship, 33 points behind Alonso. Hamilton is fifth, still 47 points adrift.